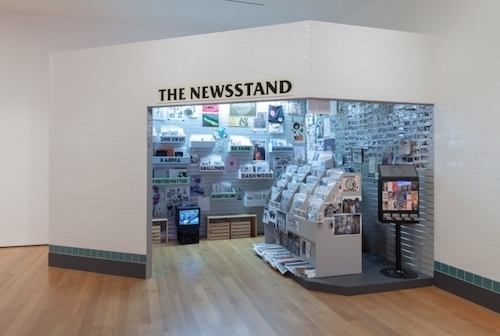 Lele Saveri, The Newsstand, 2013–14, mixed-media installation, dimensions variable. “Ocean of Images: New Photography 2015,” featuring the work of nineteen artists and artist collectives, invades sundry realms outside of the strictly photographic, such as sculpture, installation, and performance. The exhibition places a strong emphasis on the networks of communication that connect us all, while highlighting themes of image ownership, branding, and visual syntax. Using tactics that feel satirical but border on the freakily earnest is DIS, whose installation Related by Contour, 2015, exists as an enormous stock image of a “multiculti” family, plastered to the gallery wall and watermarked with the official Museum of Modern Art logo. David Horvitz’s quasi-performance piece Mood Disorder, 2015, traces the flow of images through “click-bait” websites. Katja Novitskova’s freestanding cutouts of recently discovered species of spiders, Approximation (peacock spider), 2015, which were openly sourced from image-sharing websites, transform these miniscule organisms into alarming creatures of gargantuan scale. Ilit Azoulay’s amorphously taxonomic Shifting Degrees of Certainty, 2014, expands the parameters of documentary photography by creating a mosaic of objects from Germanic culture, while Lieko Shiga’s phenomenally eerie installation Rasen Kaigan, 2010–12, captures the sights and damaged spirits surrounding the 2011 Tohoku tsunami in Japan. Elsewhere, an exact replica of Lele Saveri’s underground storefront, The Newsstand, 2013–14, which once stood in a bustling Brooklyn subway station selling posters, editions, and zines, is a loud reminder that even underground and without Wi-Fi, the future of photography is still as bright as it’s ever been.